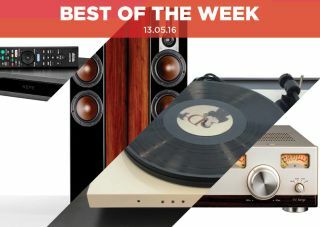 Best of the Week: Virgin Media 4K set-top box, Sony UHP-H1 multimedia player and more | What Hi-Fi? A round-up of stories to have graced What Hi-Fi? this week, including news of a Virgin Media 4K set-top box and reviews of impressive new products from Audio-Technica and Sony. This week Virgin Media confirmed to What Hi-Fi? the existence of a new 4K set-top box, Pro-Ject launched a plug 'n' play turntable and Roksan will be revising its TR-5 S2 booskhelf speaker. Elsewhere we had reviews of Sony's UHP-H1 multimedia player, Audio-Technica's AT-HA5050H headphone amp and Dali's Opticon 6 floorstander. Virgin Media has lagged behind its rivals when it comes to Ultra High Definition, but it plans to close the gap with the announcement of a new flagship 4K TiVo set-top box. The box is expected to be an updated version of its current TiVo box, which first went on sale in 2011, with Virgin confirming to What Hi-Fi? that it'll be arriving later this year. Virgin also said the existing TiVo box will be updated to make "its menus slicker and more picture-based". We've seen a number of plug 'n' play turntables on the market, and another will be joining their ranks in the form of Pro-Ject's Juke Box E.
It features Bluetooth connectivity, built-in amplification (so you can partner it with a pair of speakers), and a line output that "gives you the option of connecting it to a different system". The Juke Box E will cost £299 and goes on sale later this year. Roksan's excellent K2 speakers are getting an upgrade. The internal design and crossover will be updated, thanks to new voice coils, upgraded components and a revised printed circuit board. The ribbon tweeter and custom-designed bass driver from the original S2 will stay the same. "This is one of the most talented multimedia players we’ve seen for the money"
The UHP-H1 defies easy categorisation. Is it just a Blu-ray player? No, it's much more than that. It's a multimedia player that can handle just about anything you can throw at it (well, apart from 4K Blu-rays). There's support for hi-res audio, including SACD and DVD-Audio, music and movie streaming as well as 3D Blu-ray. We expect Sony's Blu-ray players to produce great visuals, but the extra authority to the sound is unexpected, and makes for a more rounded performance. This is one of the most talented multimedia players at this price, and we think it's terrific. "If you’re a headphone obsessive we can’t think of a better high-end amplifier"
Look at the price of this headphone amp (£4500) and you might faint. Once you've picked yourself up off the floor, you'll discover a beautiful piece of kit that's worth every penny. Fine build quality is complemented by some lovely retro-styling. This amp is heavy, but you can tell it's built to last. As for sound quality, the presentation is a wonderfully organic one that's refined and full of insight. The lack of optical inputs is a minor issue. In all other respects this high-end amplifier simply oozes quality. "Not the perfect all-rounder, but few other speakers are this entertaining"
Enthusiastic is a word that could best describe the performance of Dali's Opticon range so far. Can the Opticon 6 floorstanders maintain that reputation? Well they're bold and expressive, and come with a great sense of balance in the low end. However, they could be more delicate and refined. But given how competitive the hi-fi speaker market is, that's no disgrace. They may not be the perfect all-rounder, but few speakers on the market are this entertaining or enthusiastic.